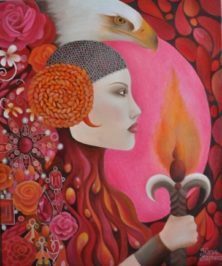 In the wee hours of pre dawn on April 5, 2019 we are graced with a New Moon in bold & fiery Aries. This is a time of rebirth, renewal, & urgent beginnings. We are compelled now to get out & make things happen, to stretch our capacity & meet our life head on. We are more creative, more passionate, & more insistent in the grips of this lunation. Now is when we fall in love, start a family, open a business or embark on a new journey. Aries is the initiator, the beginning, the warrior who pushes energetically forward. There is strength & enthusiasm & verve & nerve in this vibration. We do want to be mindful of being too impulsive or overbearing but this energy is a great collaborator to welcome changes into our life. Use the next few days to embrace the positive attributes of the rambunctious Ram: take action, try something new, go forward with gusto, be assertive, take charge & discover your personal courage. The time is ripe for manifesting, initiating, creating, taking a leap of faith & getting something started in the light of the Aries New Moon.